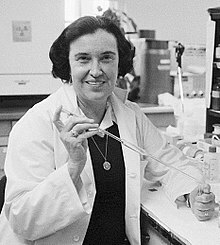 Rosalyn Yalow (July 19, 1921 – May 30, 2011) was an American medical physicist. Yalow was born on July 19, 1921 in New York City. She graduated from Hunter College in 1941. She also went to a all-female college in New York called Hunter College. Yalow was Jewish. This made it difficult to become a scientist, due to prejudice. She continued trying. Yalow got a PhD from the University of Illinois at Urbana-Champaign. Yalow became a consultant in nuclear physics at the Bronx Veteran’s Administration Hospital in 1947. She was assistant chief of radioisotope service in 1950. She was made a research professor at the Sinai School of Medicine in New York City in 1968. In 1973, she was made head of Solomon A. Berson Research Laboratory at the Bronx Veteran’s Administration Hospital. Yalow won the Nobel Prize in Physiology or Medicine in 1977. She was the second woman to win that prize. She shared the award with Roger Guillemin and Andrew Schally. Yalow was known for the creation of the radioimmunoassay (RIA). The RIA labeled things in the blood with radioactive marks. Yalow and Solomon Berson first used the RIA in 1959. It was first used to study the insulin in blood of diuabetics ( people with diabetes). This was an advancement that helped many people with diabetes. ↑ "Yalow, Rosalyn Sussman." World Book Advanced, World Book, 2017. Accessed March 29, 2017. ↑ "Rosalyn Yalow - Facts". Nobelprize.org. Retrieved September 8, 2017. This page was last changed on 16 May 2018, at 18:15.